Cassie seems to always be on a nature hunt whether were at home, at the park, and even during a visit to her Grandma M's last week! We brought the collection home with us because an idea popped into my head from something I knew I had seen at the blog The Artful Parent: Contact Paper and Nature Items Sun Catcher. We had the natural items, but just needed Contact Paper! Here is one of our Beautiful Contact Paper Nature Collages/Sun Catchers. It looks stunning with the light shining through it! 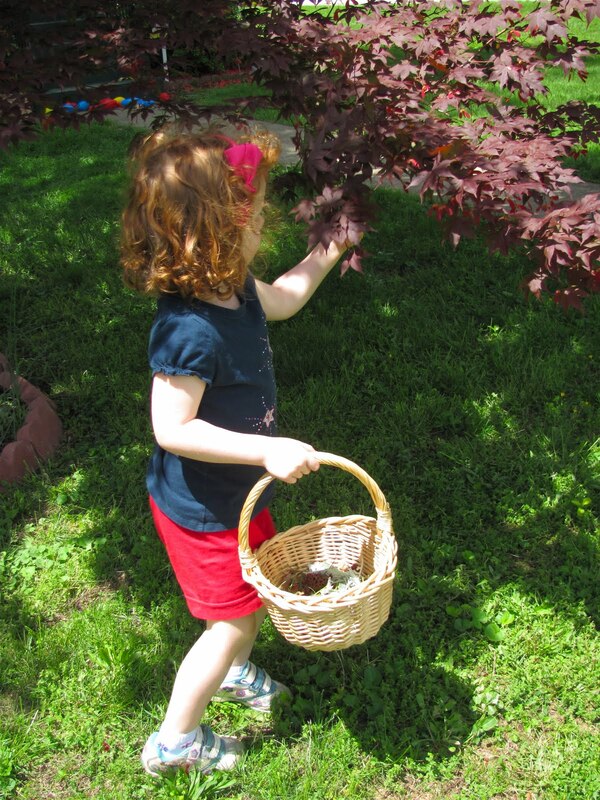 First you need to go on a nature hunt to gather flat items like petals, leaves, maple seeds, and whatever else you can think of! "My fingers are sticking, Mom!" After you are finished putting all your natural items down, you need to put another sheet of Contact Paper down over it so the items are in between two pieces. Tape your finished collage on a window and let the light shine through! Such a simple idea with Beautiful results! The items will fade, but you can watch the process of everything deteriorating if you want! Make sure to take a picture since it won't last forever! We are excited to create more of these! I just Love to look at these in our window! It brings a smile to my face every time! We can't wait to use the rest of our Contact Paper for collages with tissue paper, crayon shavings, yarn, and more! WHAT ELSE COULD YOU PUT BETWEEN CONTACT PAPER TO CREATE BEAUTIFUL ART? Check out The Artful Parent for more ideas here. This is AWESOME! I can't w3ait to try it with my little ones!!! I don't know what contact paper is and if I can find it here,but your collage looks amazing! i love contact paper collages. we made egg shaped ones at moppets with my 2 year olds a few weeks ago! have you tried using a laminator on these? i've laminated pressed flowers and it seals them airtight so they don't go bad. (i use a scotch laminator...one of the best $30 i've EVER spent!) i love your girl's hair too! she looks ALOT like my Pip when she was little. blessings friend! brilliant! I forgot about the fun of contact paper. So pretty!!! I love the flower petals - adds lots of bright colors! I can see this being interesting in the fall too! -Maybe a collection of seasons! I also like the heart frame around the contact art. It would make a really special gift. wonderful project, we did something similar with wax paper, which is also nice. thanks so much for sharing on Craft Schooling Sunday! awesome!!! Looks like a stained glass window and she is very artistic in how she placed everything. I am certain my kids wouldn't put thought into it and just lump them all together. I love the reds in it too. Lovely! Classrooms would look great with these collages! Great idea & shared with theRC! Thank you! Thanks so much for linking this up to my Summer Fun party. I just featured it (and your shadow post) in my Five Fun Ideas with Science and Nature post. Thanks for joining our party and I look forward to any other projects you share. Hello Just discovered your blog. What a great idea - will have to have a go at this with my little one. So wonderful Looks like princess. I like it and Thank you sharing with us.